We’ve to give a hard try to pick the real difference between the two cameras Nikon D7200 and Nikon D7100 as both the two cameras are successor and predecessor of each other and they’re closely resembled to one another in almost every specifications. Though,we’ll talk more on those specification in which they are dissimilar. 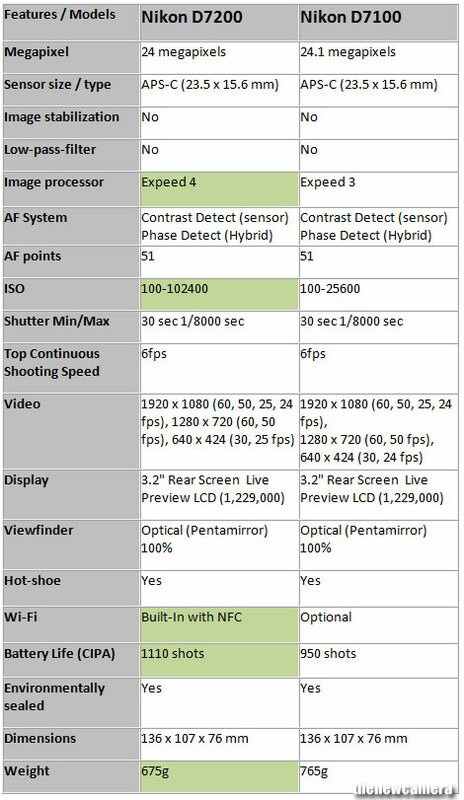 Nikon D7200 vs. Nikon D7100 Specification Comparison Table. Sensor: Despite of having same resolution and sensor size and resolution, the Nikon D7200 sensor is new so we will see for sure some performance improvement in the camera. Image processor: Just look at the table it’s clearly seen that Nikon D7200 uses Expeed 4 processor while its predecessor Nikon D7100 is operating by Expeed 3. The expeed 4 has a great help in consuming less power while capturing full HD (1080p) video at 50/60fps and decrease your anxiousness with improved contrast detection autofocus and live preview autofocus. ISO: Thanks to the new sensor the Nikon D7200 can boost up its ISO range upto 102400, whereas the Nikon D7100 ISO is limited to 25600. AF System: The AF system remains same and that’s the most disappointing point here. WiFi– Wifi with NFC in Nikon D7200 plays a key role in sharing your images and videos with your some near and closest friend or someone by connecting with their android, iOs devices,tabs etc. Battery life: The Nikon D7200 has been packed with a very powerful battery and that can apply power to the camera to take upto 1110 number of shots and on the other hand the battery of Nikon D7100 can let you to take 950 shots only. Weight and dimensions: Dimensions are of same scale to both the cameras but again the Nikon D7200 is more comfortable to carry due to its lower mass as contrast with the Nikon D7100. Verdict: Nikon D7200 have better core specification compared to Nikon D7100, the camera features new sensor, better image processor amd Built-in WiFi with NFC, hence we highly recommend you to go with Nikon D7200. I suggest including dynamic range in the comparison table. Both has pentaprism, no pentamirror.